A perianal abscess is an infection in the wall of the lowest part of the back passage. Pus is building under the skin causing swelling and pain. There is sometimes a connection with the back passage itself. You will have a general anaesthetic, and will be asleep for the whole operation. The pus is let out through a cut in the skin. The wound is packed with swabs. Antibiotics are given to help the healing. You should be able to go home after one or two days. For the first week or so after the operation, the swabs are changed for clean ones about every other day. This can be done on the ward while you are in the hospital or in the outpatients clinic or in your GP's surgery when you leave the hospital. After that you will not need any more swabs in the area and at about a month later the wound is examined to see if any more treatment is needed. If you let nature take its course, the abscess will discharge pus after several days. While you are waiting, you will have a lot of pain and a high temperature. The abscess will get much bigger than if you had it drained. Healing will take much longer. You will be off work and off colour for much longer. There is a considerable chance that the abscess can spread and you could end up with a generalised infection (sepsis) which could be potentially lethal. Antibiotics have not worked for you. Heat treatment and ointments will not help. Stop smoking and get your weight down if you are overweight. If you know that you have problems with your blood pressure, your heart, or your lungs, ask your family doctor to check that these are under control. Check the hospital's advice about taking the Pill or hormone replacement therapy (HRT). Check you have a relative or friend who can come with you to the hospital, take you home, and look after you for the first week after the operation. Sort out any tablets, medicines, inhalers that you are using. Keep them in their original boxes and packets. Bring them to the hospital with you. There is some discomfort on moving rather than severe pain. You will be given injections or tablets to control this as required. Ask for more if the pain is not controlled or if it gets worse.. A general anaesthetic will make you slow, clumsy and forgetful for about 24 hours. The nurses will help you with everything you need until you are able to do things for yourself. Do not make important decisions, drive a car, use machinery, or even boil a kettle during this time. You will most likely be able to get out of bed with help of the nurse the day after operation despite some discomfort. You will not do the wound any harm, and the exercise is very helpful for you. You should be comfortable enough to go home within one or two days. The first time you open your bowels it may be a bit painful but this rapidly improves. It is important that you pass urine and empty your bladder within 6 to 12 hours of the operation. If you find using a bed pan or a bottle difficult, the nurses will assist you to a commode or a toilet. If you still cannot pass urine let the nurses know and steps will be taken to correct the problem. The wound has a dressing held on by elastic netting pants. There may be some staining with old blood during the first 12 hours. The dressings will be removed the day after operation and will be replaced with a lighter dressing. There may be stitches in the wound. 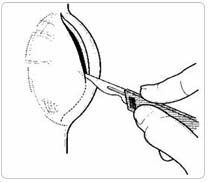 You can wash as soon as the dressings have been removed but try to keep the wound area dry for the time (about a week) you will have swabs in the wound. Soap and tap water are entirely adequate. Salted water is not necessary. You may be given an appointment to visit the outpatient department for a check up one week after you leave hospital. Any stitches will be taken out at this visit. Some hospitals arrange a check-up about one month after you leave hospital. Others leave check-ups to the general practitioner. The nurses will advise about sick notes, certificates etc. You will be given dressings to use at home as needed. You will be given a supply of antibiotics. You may be uncomfortable for three to four days. The wound should heal within two weeks. You can drive as soon as you can make an emergency stop without discomfort in the wound, i.e. after about 10 days. You can restart sexual activities within a week or two, when the wound is comfortable enough. You should be able to return to a light job after about one week, and any heavy job within two weeks. Complications are relatively rare and seldom serious. If you think that all is not well, please let the doctors or nurses know. The wound is always a bit moist for a week or two. There is likely to be a discharge of yellow matter and even some dark blood on the dressings during this time. Opening your bowels will rapidly become easier, particularly if you take a laxative. DO NOT however take bran or a high-fibre diet until the back passage is pain-free in case you end up with a blockage. There is a very small chance that you may experience some persistent bleeding after the operation or, even more rarely, there is chance that some damage will be caused to a vessel, a nerve or your back passage during the operation. In a situation like this you will need another operation to fix the problem. The operation to drain the abscess solves the problem completely in just over 50% of cases. In the remaining patients a small permanent communication (fistula) can develop between the back passage and the skin with recurrent local infection, which can, in some people (like the elderly or diabetic patients) develop into an abscess again. If this is the case you will probably need another operation correct the fistula between the back passage and the skin. If you have any problems or queries, please ask the doctors or nurses.